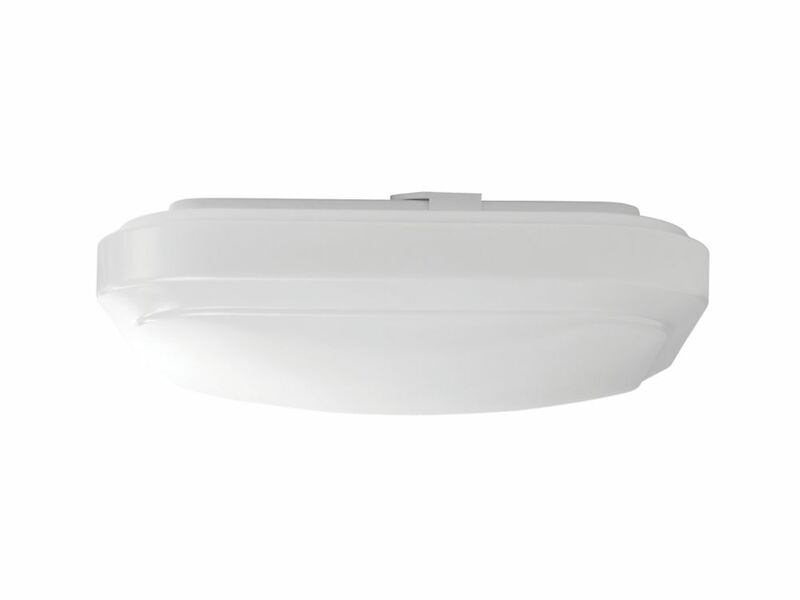 The Hampton Bay 12" LED flushmount ceiling light offers high-quality LED illumination that is perfect for kitchens, laundry rooms, closets, garages and basements. The frosted white acrylic lens distributes light evenly and has a low profile design that can be mounted on either a ceiling or a wall. Its lightweight construction makes installation easy. Dimmable, this versatile flushmount features long-lasting, energy efficient LED technology that produces 1000 lumens of bright white light (4000k Correlated Color Temperature). Equivalent to 75 watts of incandescent light, it uses only 14 watts of power, saving up to $336 in energy costs over the life of the fixture. ENERGY STAR certified and cUL rated, with its integrated LED design, there are no bulbs to replace! Clear seeded glass from flushmount sends reflections across porch, deck, and garden areas. Down facing bulb gives brightest light around porch and entry areas. Made of weather resistant cast aluminum. The Eglo Focus Ceiling Light in a matte nickel finish complimented by chrome accents and a clear glass panel is reminiscent of an industrial design and will suit an eclectic or contemporary dicor. This unique ceiling light is approximately 13" wide by 6" high and 6" deep. The two heads pivot for flexibility in directional lighting. Consider this ceiling fixture in place of any standard flush mount for the kitchen, bedroom, hallway, den, or office. Use two GU10 type bulbs, max. 50W each included for your convenience. This light fixture can be used with any standard 120V dimmer for the widest flexibility of light output. Square Led Flushmount Ceiling Light - 12 Inch - ENERGY STAR® The Hampton Bay 12" LED flushmount ceiling light offers high-quality LED illumination that is perfect for kitchens, laundry rooms, closets, garages and basements. The frosted white acrylic lens distributes light evenly and has a low profile design that can be mounted on either a ceiling or a wall. Its lightweight construction makes installation easy. Dimmable, this versatile flushmount features long-lasting, energy efficient LED technology that produces 1000 lumens of bright white light (4000k Correlated Color Temperature). Equivalent to 75 watts of incandescent light, it uses only 14 watts of power, saving up to $336 in energy costs over the life of the fixture. ENERGY STAR certified and cUL rated, with its integrated LED design, there are no bulbs to replace!